2 Business Day Turnaround Time! CALL US at (315) 627-0524. 25% OFF SUPER CAMP PACKS THROUGH APRIL 30th! NO CODE NEEDED! 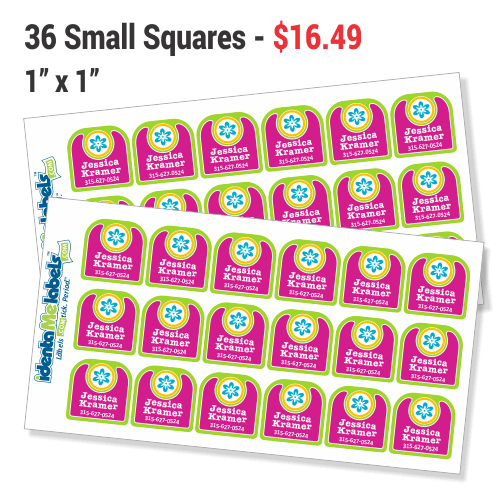 Small Square Clothing Labels - 1" x 1"
Stick On Clothing Labels are great for all types of clothing! Our only clothing name label that offers you up to three lines of text. 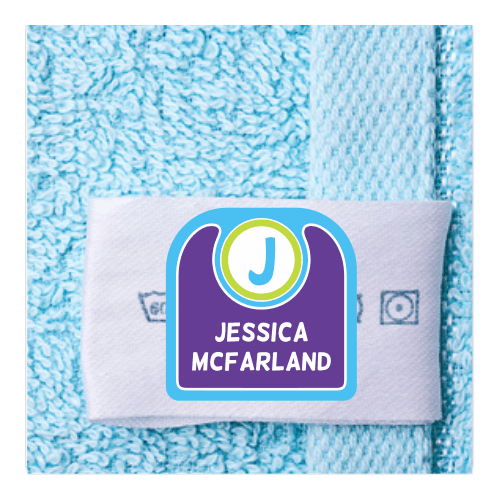 Go with a simple look, or choose from hundreds of available styles, patterns and colors for your custom square clothing labels! 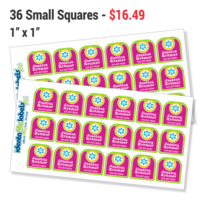 36 labels for $16.49 USD. Laminated for long-lasting durability on clothing. Stick to garment care tags or brand stamps. 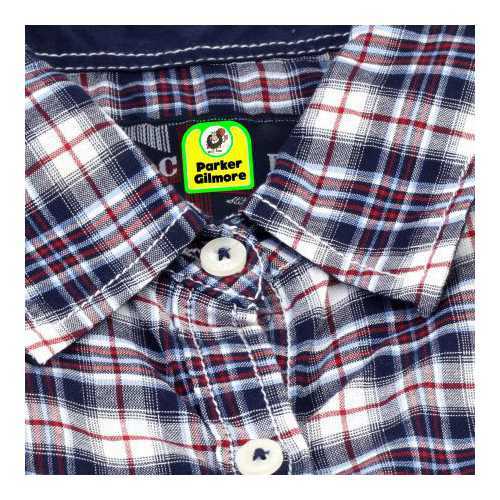 Stick on clothing labels - no ironing and no sewing. Laminated so they stay looking great wash after wash.
Our Small Square Clothing Labels can have up to three lines of text and can be used on just about any clothing item. These laundry safe clothing labels are backed with an industrial strength adhesive, so they're wicked sticky and will stay stuck wash after wash! Use all three lines of text to include phone or email, or keep it simple and use one or two lines for name only. 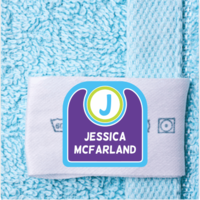 Create custom clothing labels for kids with IdentaMe Labels, get started today! You might also be interested in our Iron On Small Square Labels! Product Safety Information Our Small Square Labels SHOULD BE APPLIED BY AN ADULT or WITH ADULT SUPERVISION. All of our labels are made with non-toxic materials and eco-solvent inks. Our labels are super sticky and durable but they're not truly permanent. They're made to come off with intent. Continued picking or chewing can make a label come loose from clothing and other materials. Keep an eye on the labeled items if they're going to be used by young children to make sure that they stay intact and are not accidently ingested. be especially careful when labels are used on teething rings, pacifiers, blankets etc. Our Small Square Clothing Labels are laundry safe. 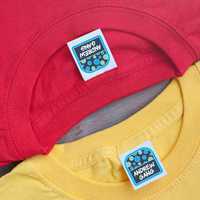 Stick your labels to the garment's care tag or directly to the brand stamp or stick to any clean, dry, hard surface. 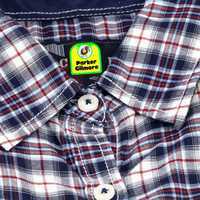 Make sure label corners are securely adhered to the fabric (surface) and that there are no air bubbles under the label. After sticking your label - wait 24 hours before washing. Socks and underwear can be tricky to label. 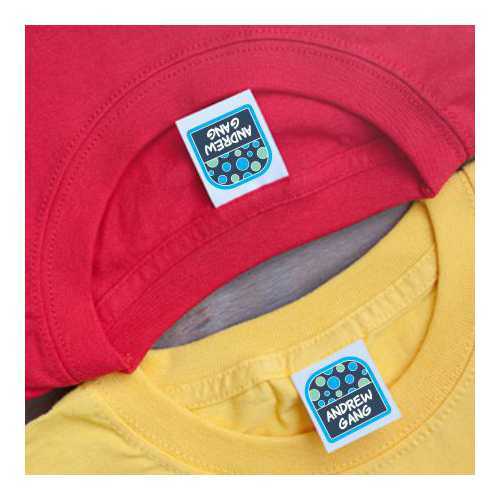 We recommend using our iron-on labels but if you prefer to use our stick-on clothing labels - here are a few tips! Apply the labels to a part of the fabric that doesn't get stretched alot. Stick the labels on the clothing and then pop the clothing into the dryer for a few minutes to heat the labels. While the labels are still warm use your finger to go over them one more time. Current Label turnaround time is shown in RED at the top of this page. Your Small Square Labels will ship using USPS First Class mail unless you choose one of our faster options when you checkout. The faster options are USPS Priority, USPS Express, and FedEx Three Day. We can also ship your labels using UPS or other FedEx options - just give us a call and we can work out the details and the cost with you. If you'd like to provide us with your UPS / FedEx account number, we'll have your account billed directly. Postage and handling charges are based on the dollar amount of your labels. machine and numerous hand washings." safe and secure with us! We use a Secure Sockets Layer (SSL) Protocol to make sure all your information is encrypted and transmitted without risk! Enter your email in the box below to be one of the first to find out about awesome sales and new products!